Jayne Gorman takes us on a celeb spotting tour around the gorgeous island of Barbados but who will we bump into along the way? If you were to glance at any glossy magazine around Christmas time you would no doubt be greeted with a photo of a glowing celebrity frolicking in the Bajan surf. When I had the chance to visit Barbados last winter I decided to try and track down some of the local and visiting celebs myself, by hanging out in all the luxurious parts of the island. Here’s what I learnt. Simon Cowell has been known to stay at Sandy Lane and also likes to rent villas such as Cove Spring House, which is found on the same strip of West Coast. He is also a patron and benefactor of the Hope Dog Sanctuary, based in St John. Despite walking past the Sandy Lane patch of coast almost everyday of my trip I couldn’t spot any famous faces on the sun loungers. It was time to look elsewhere. 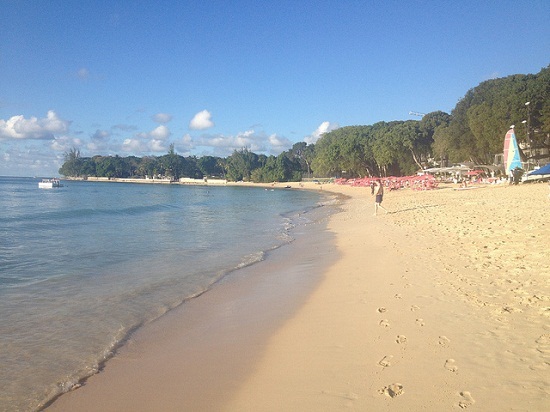 Holetown is the shopping and residential heart of St James and is where Cliff Richard owns a Barbadian home. Set back from the beach his property offers a little more privacy than those on the coast. I thought I might have better luck spotting a famous face at Holetown’s latest edition to the shopping scene. 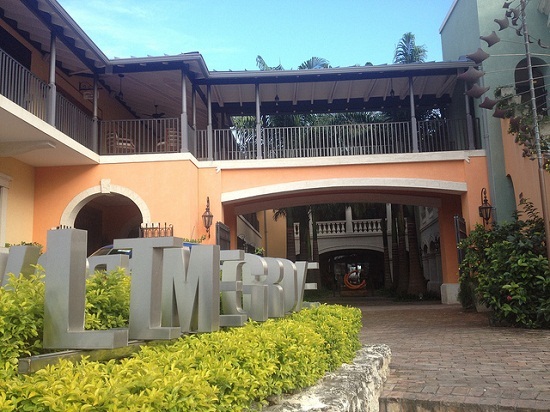 Limegrove Lifestyle Centre is a luxury retail and residential complex housing brands such as Gucci, Burberry and Cartier, as well as high-end eateries and a cinema. Further down the street is the most charming shopping village I have ever seen. Modelled on the traditional Barbados chattel houses, in ice cream colours of lemon and pink, the little huts hosts clothing and gift boutiques full of things you will want to take home. I spent a whole afternoon mooching around the shops and camping out in the coffee shops but still I saw no famous faces. I did meet a woman who had once massaged Cowell but no sign of the man himself. After working up an appetite at Limegrove I thought it would help my task if I dined at one of the islands high-end beachside eateries. The Tides is a classy seafront venue that looks like a luxury adult tree house. You dine at The Tides surrounded by white curtains hanging from the trees with the warm ocean lapping the beach inches from your feet. The service is exceptional, the seafood exquisite and the desserts are not to be missed. But after scanning the faces of the beautiful guests around us, I didn’t recognise but one of them. After checking in for my return flight I thought I was going home having failed my task. 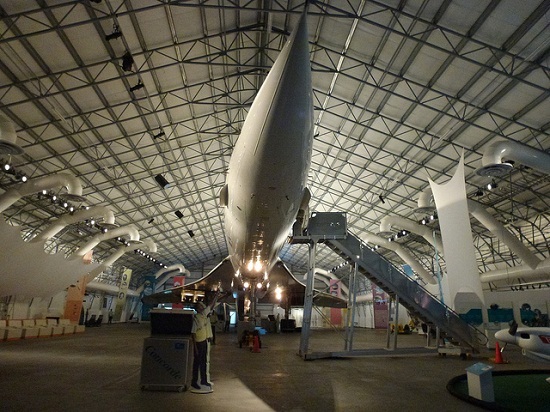 But a sign on a hangar building next to the airport caught my eye – ‘Concorde Experience’ – that sounds like something a celebrity would enjoy, I thought. Having checked in my luggage I raced over to the next building and paid the £15 entrance fee. If it were still running I have no doubt that the celebrities coming to Barbados would be travelling by Concorde. Barbados was one of 4 main routes served by Concorde after London, Paris and New York and could take passengers from London to Barbados in a supersonic 3 hours and 45 minutes. Today, sadly, this is not an option but at the Concorde Experience I was going to get my one and only chance to board a BA Concorde. In the surprisingly small but all First Class cabin of the plane I took a seat and a video began to play via the inflight entertainment system. And there they were –finally – celebrities talking about their Concorde Experience in Barbados. As the familiar faces of Judith Chalmers, Michael Winner and, bizarrely, Andi Peters, came on screen, I felt I could go home with my challenge completed.